Caltex’s multi-awarded Fuel Your School (FYS) program is now set to help fund projects in Science, Technology, Engineering and Mathematics (STEM) for high-need public high schools in Bicol region. From July 1 to August 31, Caltex will donate one peso (P1) for every liter of fuel purchase in the 22 Caltex stations in Bicol. 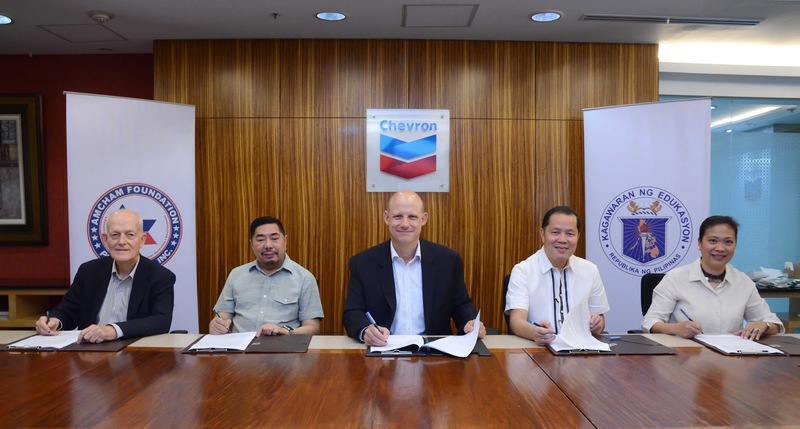 Chevron Philippines Inc. (CPI), marketer of the Caltex fuels and lubricants, aims to raise three million pesos (P3M) under this fuel-to-donate program. Photo above show (L-R ) American Chamber Foundation (ACF) Director and Internal Auditor Roberts Sears; Southern Cross Distributors Inc., Chairman Jose Mari Delgado; CPI Country Manager Peter Morris; Department of Education (DepEd) Region V Asst. Regional Director Tolentino Aquino; and CPI Manager for Policy, Government and Public Affairs Atty. Raissa Bautista during the MOA signing. Under the MOA, DepED will select Bicol’s highest need public high schools which can submit projects eligible for funding under the program while ACF will screen the projects and purchase the equipment for the qualified entries. SCDI, which is the pioneer Branded Marketer partner of Chevron and distributes Caltex fuels in the Bicol region, will help fund the program, as well as promote FYS. There will be 22 Caltex stations in Bicol that will participate in this program. This year, high schools across the country will need more equipment as the first batch of grade 12 senior highs schoolers enter the government’s K-12 education system.